Have you ever woke up and no matter what you do your hair won't behave? The Everyday Star gives you a second option. With the Everyday Star you will never have to hide your hair under a hat, those days are well and truly over! 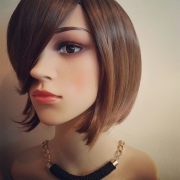 The shorter Everyday Star is a beautiful bob cut with a soft flowing side fringe that will hug the contours of your face. Short wigs with a fierce blunt fringe.